Hydrocarbons and their alkyl, alkenyl and alkynyl derivatives which contain one or more benzene rings either fused or isolated in their molecules are called aromatic hydrocarbons. Benzene ring is highly unsaturated and in most of the reactions of aromatic compounds, the unsaturation of benzene ring is retained. Aromatic hydrocarbons containing a benzene ring are called benzenoids, those not containing a benzene ring are called non-benzenoids. Arenes are further classified into different series depending upon the number of fused benzene rings present in their molecules. Their general formula is CnH2n-6m where n is the number of carbon atoms and m is the number of rings. Benzene is a symmetrical molecule i.e. all the six hydrogen atoms of benzene are equivalent. Therefore, the replacement of one hydrogen atom of benzene by any substituent will give only a single product. Thus monosubstitution products of benzene do not show isomerism. When two hydrogen atoms of benzene ring are replaced by two same or different substituents , three isomers are possible which differ in the position of substituent. 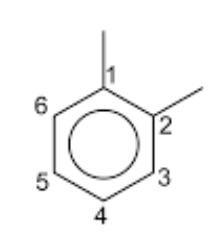 Thus , disubstitution products of benzene show position isomerism. These three isomers are called ortho, meta and para according as the relative position of the two substituents are 1,2 ; 1,3 and 1,4. If the number of substituents increases in the benzene ring, the number of position isomers also goes up. The molecular formula of benzene is C6H6.Benzene is a highly unsaturated compound. 1)Benzene adds three molecules of hydrogen in presence of Raney nickel or platinum as catalyst at 473-523 K to form cyclohexane. 2) In presence of sunlight and in absence of halogen carrier, benzene adds three molecules of chlorine to form benzene hexachloride. 3)With ozone it forms triozonide. Benzene undergo substitution rather than addition reaction: Benzene is an unsaturated compound yet it does not undergo addition reaction. It does not decolourise bromine in carbon tetrachloride solution. It undergoes substitution reaction which are characteristics of saturated compound. When treated with Br2 in presence of a trace of FeBr3 , benzene forms monobromobenzene. Benzene is resistant to oxidation: Benzene does not decolourise alkaline KMnO4. With powerful oxidising agents such as chromic acid ,potassium permanganate, it is very slowly oxidized to CO2 and H2O. Thus benzene resists oxidation like saturated compounds. Friedrich August Kekule proposed that the six carbon atoms of benzene are joined to each other by alternate single and double bonds to form a hexagonal ring. Each carbon is further connected to a hydrogen atom. 1) Since all the bond angles in benzene are 120° ,therefore, all the carbon atoms of benzene are assumed to be sp2 hybridized. 2) Each carbon atom forms two C-C, σ bonds with the neighbouring carbon atoms and one C-H , σ bonds with a hydrogen atom. 3) In all there are six C-C σ bonds and six C-H σ bonds which all lie in one plane and angle between any two adjacent is 120°. 4)Each carbon is now left with an unhybridized p-orbitals. These six unhybridized p- orbitals have one electron each and are not only parallel to one another but are also perpendicular to the plane of bonded carbon skeleton. 5)Any two p-orbitals on adjacent carbon atoms are close enough for a sideways overlap to form π bonds. 6) Each 2p-orbital overlap equally with 2p-orbitals on adjacent carbon atoms on either side to form two doughnut shaped electron cloud ;one of which lies above and other below the plane of carbon and hydrogen atoms. 7) Two p-orbitals are not confined to a single π bond between two carbon atoms but are involved in the formation of more than one π bond. This participation of π electrons in more than one bond is called delocalisation of electrons. 8) These delocalized electrons are equally attracted by all the six carbon atoms of the benzene ring. As a result ,all the carbon carbon bond length(139 pm) in benzene are equal, all the carbon-hydrogen bonds(110 pm) are equivalent ,its dipole moment is zero and does not show the type of isomerism. 9)The hexagon represents the six carbon atoms, the circle represents the six completely delocalised π electrons. 10) It is this delocalisation of π electrons which makes it more stable. The phenomena of resonance is said to occur if for a molecule ,we can write two or more than two Lewis structures which differ in the position of electrons and not in the relative position of atoms. The various Lewis structures are called Canonical structures or the resonance structures .The real structure of the molecule is not represented by any one of the canonical structure but is a resonance hybrid of the various resonance structure. The various resonance structure are separated by a double headed arrow(↔). Since the two canonical forms are of equal energy so they contribute equally towards the resonance hybrid. Structure of the resonance hybrid is in between these two kekule structures. This means that any two adjacent carbon atoms of the benzene molecule are neither joined by a pure single bond nor by a pure double bond. As a result, all the carbon-carbon bond lengths are equal i.e.1.39 A° and lie in between C=C bond lengths of 1.34 A° and C-C bond length of 1.54 A°. Resonance energy or delocalisation energy is defined as the difference in internal energy of the resonance hybrid and that of the most stable canonical form. Huckel on the basis of molecular orbital theory, has predicted that electrons in cyclic conjugated polyenes containing (4n+2) π electrons where n=0,1,2,3 ….are completely delocalised. All such compounds are called aromatic compounds and have chemical properties altogether different from other cyclic unsaturated compounds which do not contain (4n+2) π electrons. 1) It should have a single cyclic cloud of delocalised π electrons above and below the plane of the molecule. 2) It should be planar.This is due to the reason that complete delocalisation of π electrons is possible only if the ring is planar to allow cyclic overlap of p orbitals. Any planar cyclic system containing 2, 6 ,10 ,14, 18 π electrons and having a single cyclic π electron cloud encompassing all the carbon atoms in the ring is aromatic. Huckel rule can also explain the aromaticity of polycyclic compounds. For example: Naphthalene which contains 10 electrons, anthracene and phenanthrene each containing 14 electrons are all aromatic. 2) Heterocyclic compounds: Heterocyclic compounds such as pyridine, furan, thiophene and pyrrole are all aromatic since each one of them is planar and has a cyclic system of 6 π electron which is completely delocalised over the entire range. In pyridine ,each of the 5 sp2 hybridised carbon atoms and the sp2 hybridised nitrogen atom has a p orbital perpendicular to the plane of the ring. Each of these atoms contributes one π electron thereby producing a single cyclic π-cloud containing 6 π electrons. The Lone pair of electrons on the nitrogen atom is present in a sp2 orbital which being in the plane of the ring does not contribute towards the aromatic sextet. In furan and thiophene ,one of the two lone pairs of electrons on the sp2 hybridized heteroatom is present in a p orbital perpendicular to the plane of the ring. It contributes two π electrons while the other four p-orbitals of the two double bonds contribute one electron π each thereby bringing the total to 6 electrons. Pyrrole has only one lone pair which is present in a p-orbital perpendicular to the ring. Therefore, it contributes two π electrons while the four p orbitals of the two double bond contribute one π electron each thereby bringing the total to six electrons. All the three five membered heterocycles have a single cyclic electron cloud containing 6 electrons and hence are aromatic in character. This theory of six electrons explaining the aromatic character of cyclic compounds is called aromatic sextet theory and the six π electrons are called aromatics sextet. 4) Annulenes : Completely conjugated monocyclic polyenes containing an even number of carbon atoms are called annulenes. Their general formula is (CH=CH)n where n=2,3,4 ……etc. Benzene was first synthesized by Berthelot by passing ethyne through red hot iron tube at 873 K.
5) From benzenediazonium chloride by reduction with hypophosphorus acid in presence of Cu ions. 6) From benzenesulphonic acid by heating with superheated steam. 7 From n-hexane and n-heptane : When hexane under a pressure of 10-20 atm is passed over a catalyst consisting of oxides of chromium, vanadium and molybedenum supported over alumina at 773 K, it gets converted into benzene. Homologues of benzene can be prepared by warming a solution of a suitable haloarenes and a haloalkanes in presence of metallic sodium in dry ether. Benzene reacts with alkyl halides in presence of Lewis acid catalyst such as anhydrous to form alkylbenzenes or arenes. Instead of alkyl halides, alcohols can be used in Friedel-Crafts reaction.Here, the lewis acid helps in the generation of a carbocation which then attacks the benzene ring to form the corresponding alkylbenzene. Friedel-Crafts reaction can also be carried out with alkenes in presence of protonic acids such as H2SO4 , H3PO4 , HF. 1) Physical state, colour, smell : Benzene and its homologues containing upto 8 carbon atoms are colourless liquid while the higher ones are solid with characteristics smell. 2) Combustion : Due to high carbon content, they burn with a sooty flame. 3) Solubility:Due to large hydrophobic hydrocarbon part ,arenes are not soluble in water but are soluble in organic solvents. 4) Melting point and boiling point: The boiling point of arenes increases with increase in the molecular size due to the corresponding increase in the magnitude of Van der Waals forces of attraction. Melting point depends upon molecular size and symmetry. The more symmetrical the molecule ,better it fits in the crystal lattice and hence higher is its melting point. Amongst isomeric arenes, ortho ,meta and para xylene, the p-isomer which is most symmetrical ,has the highest melting point. Arenes are highly unsaturated hydrocarbons but behave like saturated hydrocarbons. They are more reactive than alkanes but are less reactive than alkenes and alkynes. This lower reactivity of arenes is because of the extra stability associated with these molecules due to delocalisation of electrons. A reaction in which one or more hydrogen of the benzene ring are replaced by other monovalent atoms or group is called a substitution reaction. 1) Halogenation : Benzene reacts with chlorine and bromine in presence of Lewis acid such as AlCl3 , FeCl3 , FeBr3 as catalyst and in absence of light to form chlorobenzene and bromobenzene. If excess of electrophilic reagent is used, two or more or even all the hydrogen atoms of benzene ring may be replaced by the electrophilic. Benzene on treatment with excess of Cl2 in the presence of anhydrous AlCl3 in dark yield hexachlorobenzene. The function of Lewis acid is to carry the halogen to the aromatic hydrocarbons.In addition to iron and aluminium halides, iodine and iron filling have been used as halogen carrier. Chlorobenzene is formed when benzene is treated with chlorine in presence of iron.Under these conditions , iron first reacts with chlorine to form ferric chloride which then act as a catalyst. Fluorination of arenes is too vigorous to be of any practical use. 2) Sulphonation : The process of replacement of a hydrogen atom of an arene by a sulphonic acid group(-SO3H) is called sulphonation. It is usually carried out by treating an arene with fuming sulphuric acid or oleum or chlorosulphonic acid. 3) Nitration : The process of replacement of a hydrogen atom of an arene by the nitro group(-NO2) is called nitration. It is usually carried out by treating an arene with a mixture of conc HNO3 and conc H2SO4. a) Friedel Crafts alkylation : When benzene or its homologue is treated with an alkyl halide, in presence of anhydrous aluminium chloride as catalyst , it forms an alkylbenzene. b) Friedel Crafts acylation: On treatment with a carboxylic acid chloride or the anhydride in presence of anhydrous aluminium chloride, benzene forms an acylbenzene. Benzene and its homologue usually do not undergo addition reaction because of the extra stability of these molecules due to delocalisation of π-electrons.Under drastic conditions i.e. high temperature and pressure , they do undergo addition reaction. 1) Addition of dihydrogen-Hydrogenation: Benzene adds three molecules of dihydrogen in presence of Raney nickel or platinum as catalyst at 473-523 K to form cyclohexane. 2) Addition of halogens: in presence of sunlight and in the absence of halogen carriers , benzene adds three molecules of chlorine to from benzene hexachloride or Gammexane. 1) Complete oxidation : Arenes readily burn on heating in air or oxygen producing CO2 , H2O along with a luminous yellow sooty flame.